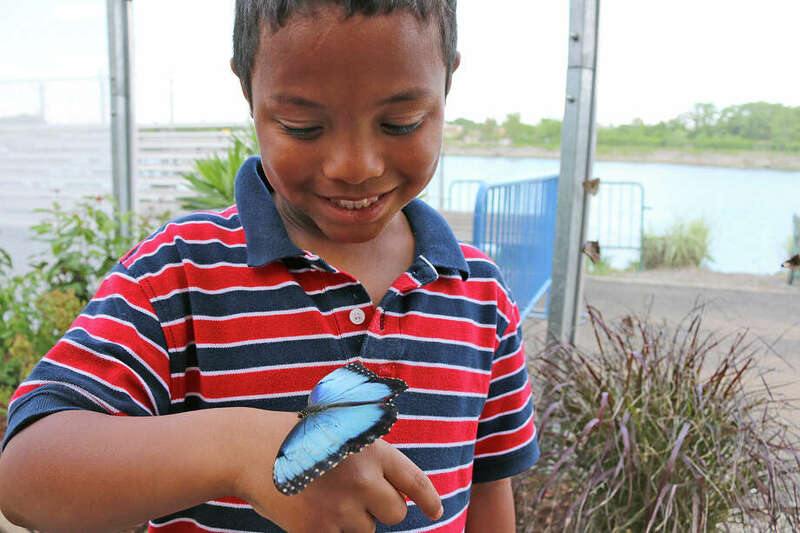 Tropical butterflies fly freely this summer in the “Flutter Zone” at the Maritime Aquarium at Norwalk, to the delight of the exhibit’s visitors of all ages. Butterflies are stealing the show again this summer at the Maritime Aquarium at Norwalk. The interactive walkthrough exhibit "Flutter Zone" returns May 28 to the Maritime Aquarium at Norwalk, an encore to last year's popular run. The exhibit offers visitors the chance to mingle with tropical butterflies flying freely in the aquarium's riverfront courtyard. "They are not the kind of butterflies you'd see in your backyard garden," Dave Sigworth, publicist for the Maritime Aquarium, said of the exhibit's featured guests from Asia and South America. When not marveling at the colorful, winged-insects dancing in the air above, visitors can explore the metamorphosis of butterflies through a display chronicling the stages of their life cycle. Adjacent to Flutter Zone is a "pollinator's garden," sprouting with plants crucial to native butterflies. It's a component of the aquarium's conservation efforts. "This year and last year we added a message about the monarch butterfly, which is very dependent on milkweed," Sigworth said. Humans see milkweed as a pesky weed and kill it, but the aquarium is hoping visitors will be inspired by the pollinator's garden or one of the many other butterfly-themed events taking place this summer. On June 15, the wine-tasting fundraiser "Flutter and Flights" will be held among the butterflies in the courtyard. The event features wines from around the world and offerings from local restaurants. The Maritime Aquarium at Norwalk, 10 N. Water St., Norwalk, is open 10 a.m. to 5 p.m. daily. Admission is $22.95 for adults, $15.95 for ages 3-12, 20.95 for ages 13-17 and 65+. "Flutter Zone" runs May 28 to Sept. 5. Admission is included with aquarium ticket. "Flutter and Flights" wine tasting, 6-8 p.m., June 15. $35. Ages 21+. "Breakfast with the Butterflies," 8:30 to 10 a.m., June 26. $40 adults. $20 children 3-12. "Flight of the Butterflies," May 27-June 30. One movie is included with admission. "National Parks Adventure," daily, May 27-June 30. One movie is included with admission. Central Long Island Sound Lighthouse Cruise. 10 a.m., June 4. More dates planned. $70. Western Long Island Sound Lighthouse Cruise. 9 a.m. May 28 and June 25. More dates planned. $75. Marine Life Study Cruises. 1 p.m. Saturdays and Sundays through June 19. Daily beginning June 20 through Labor Day. $29.95. Sunset Cruises. 6:30 p.m. Adults-only (21+), $49.95, May 21 and monthly through September. Family. $29.95, June 24 and monthly through September. Maritime Aquarium Summer Camp. Ages 6-15. 9:30 a.m. to 4 p.m., weekly from June 27 to Aug. 26. $450-$550. Teen Apprentice program. Ages 13-15. 8 a.m. to 2 p.m. July 11-29 and Aug. 8-26. $1,500. "Animals Without Passports." Runs through Jan. 2. Admission is included with aquarium ticket. "Dragons! Real or Myth?" Runs through Labor Day. Admission is included with aquarium ticket. Then, on June 26, guests will be given the chance to feed the Flutter Zone's butterflies after being treated to breakfast along the Norwalk River. This special event, "Breakfast with the Butterflies," is limited to 20 participants. The butterfly theme extends to the aquarium's IMAX screen, which will show the 2012 documentary "Flight of the Butterflies" from May 27 to June 30. The film explores a Canadian zoologist's 40-year scientific investigation into the mystery of where monarch butterflies go in the winter. New to the aquarium's IMAX theater this summer is "National Parks Adventure." The Robert Redford-narrated short film guides viewers through America's most treasured landscapes, including Yellowstone, Yosemite, and the Everglades. For visitors ready to take their own adventure, the Maritime Aquarium is again offering a series of cruises on its new hybrid-electric research vessel. Lighthouse lovers will get the chance to take an up-close look at the historic beacons of Long Island Sound on two separate lighthouse cruises. A five-hour cruise of central Long Island Sound will make passes of five lighthouses: Peck Ledge, Greens Ledge, and Sheffield Island in Norwalk, Penfield Reef Lighthouse in Fairfield, and Stratford Shoal Light. A six-hour cruise of western Long Island Sound will take visitors by eight lighthouses, including Greens Ledge and Sheffield Island lighthouses in Norwalk, Harbor Ledge in Stamford, and Greenwich's Great Captain Island. The next lighthouse cruise of central Long Island Sound is slated for June 4. Upcoming cruises of western Long Island Sound are scheduled for May 28 and June 25. Another cruise offered by the aquarium lets visitors explore Long Island Sound's diverse array of sea life. Participants can get hands-on with the crabs, fish, squid, mollusks, and other creatures brought to the surface by the vessel's trawl net. For those wanting to experience even more of Long Island Sound's natural wonders, a sunset cruise to the Norwalk Islands is timed to let visitors watch as dusk envelops Long Island Sound. Adults-only cruises (21+) and family cruises are planned monthly through September. Advance registration for the aquarium's cruises is strongly recommended. Future scientists will want to check out the Maritime Aquarium Summer Camp. Weeklong programs let children 6 to 15 explore the scientific world through experiments and activities. Topics include "Shark Safari" and "Junior Marine Biologist." the opportunity to work alongside the aquarium's workers and educators. Visitors will want to be sure to save time for two special exhibits currently running at the aquarium. "Animals Without Passports" takes an in-depth look at the challenges facing humpback whales in the waters off Cape Cod. The exhibit runs through Jan. 2, 2017. "Dragons! Real or Myth?" features one of only 31 black dragons in the U.S. — and the only one in the country on public display. The exhibit, which focuses on this water-monitor lizard and other animals named after dragons, runs through Labor Day.